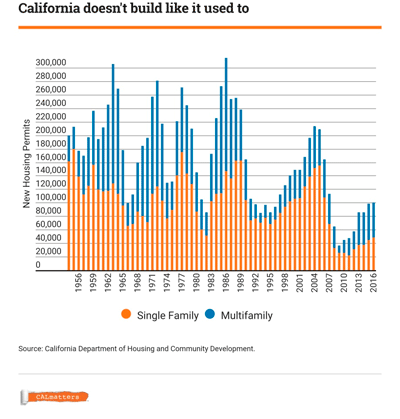 New California economic reports show that we are currently head deep in a new housing crisis. Homeownership, once part of the American dream, is at its lowest rate since World War II. Roughly half of the state’s homeowners are struggling to afford their mortgage and 70 percent of lower income Californians see most of their paychecks go to mortgage and rent payments. The average California home costs nearly $500,000, which is more than twice the national average. The new housing bond and laws would aim at streamlining the planning and development of new residential units. It is estimated that 38 percent of California’s 18 to 34 year old population still live with their parents. Student debt, smaller labor markets and millennials delaying marriage and children until later in life are contributing to the trend of lower home ownership as well.